GolfBC introduced The Okanagan Golf Club to Kelowna in 1999, a spectacular complement to Kelowna's premiere golf product. Exceptional by design, The Okanagan Golf Club boasts 36 holes of spectacular championship golf; The Quail Course and Golden Bear Designed - The Bear Course, a spacious clubhouse facility, double-ended practice facility and convenient location near the Kelowna International Airport. The Okanagan Golf Club experience is defined by a combination of exceptional golf courses, beautiful surroundings, world-class amenities and a commitment to quality service. The Okanagan Golf Club Management thanks you for your interest in our facility and welcomes the opportunity to provide you with a tour and any further information that you may require. 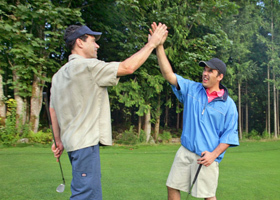 Best Member Course in the Okanagan Valley! Spectacular conditions. Double ended Practice Facility with Practice Greens, Practice Bunkers and Teaching Academy with CPGA Instructors. Clubhouse and Lounge offering Breakfast, Lunch, Dinner and Theme Nights. Plenty of Member Events. This and much more ADDS UP to the Okanagan Valley’s Best Membership offer! BONUS $100/$150 Food & Beverage Credit*!! Reduced fee for your guests and reduced rates at other Zone 2 golf clubs. Reduced rates at other Zone 2 golf clubs for primary corporate contact. Clubhouse signing privileges for primary corporate contact.